A team of neurosurgeons at Heidelberg University Hospital and psychiatrists at the Central Institute of Mental Health, Mannheim have for the first time successfully treated a patient suffering from severe depression by stimulating the habenula, a tiny nerve structure in the brain. The 64-year-old woman, who had suffered from depression since age 18, could not be helped by medication or electroconvulsive therapy. Since the procedure, she is for the first time in years free of symptoms. Scientific studies have shown that the habenula is hyperactive in depression, the idea was to downregulate this structure by deep brain stimulation. The surgical procedure is based on a hypothesis of how the habenula is involved in depression that was first formulated by Dr. Alexander Sartorius, psychiatrist at the Central Institute for Mental Health (CIMH; Director: Professor Andreas Meyer-Lindenberg; former Director CIMH Professor Fritz Henn, Brookhaven National Laboratory, New York). The stereotactic procedure at the Neurosurgery Department of Heidelberg University Hospital (Medical Director: Professor Andreas Unterberg) was performed by Dr. Karl Kiening, head of stereotactic neurosurgery. The concept of habenula stimulation and the case study were published in the leading scientific journal Biological Psychiatry. Depression is a common psychiatric illness; some one third of patients do not respond to medication or psychotherapy. Electroconvulsive therapy, used for such severe or treatment resistant cases, is also not always effective. This was also the case for the Heidelberg/Mannheim patient, who never reached sustained remission after electroconvulsive therapy. In deep brain stimulation, electrodes are inserted into the brain and are connected with wires under the skin to an electronic impulse generator implanted in the chest. The electrodes emit current that continuously stimulates specific areas of the brain. This therapy, also described as "brain pacemaker", is already used successfully for patients suffering from Parkinson's disease or other movement disorders. Depressive patients have already been treated with electrostimulation with some success. However, two other areas of the brain were stimulated, located in the forebrain or midbrain regions. The habenula (Latin for the diminutive of reins) is located further downstream next to the brain stem. "We decided to stimulate the habenula because it is involved is the control of three major neurotransmitter systems, which are known to be disturbed in depression,'" explained psychiatrist Dr. Alexander Sartorius from the Central Institute of Mental Health. The neurosurgical implantation of two electrodes demands utmost precision in planning and performance. 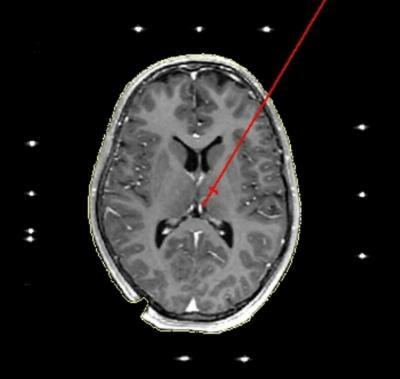 The target area is about half as large as the others that are typically targeted for movement disorders, and in addition, is located in the middle of the brain, i.e. in the wall of what is known as the 'third ventricle'. Implanting the electrodes in the two habenulae therefore requires the utmost precision that can currently be achieved with stereotactic instruments. "The neurosurgery department at Heidelberg University Hospital is optimally equipped for demanding procedures such as this with among other things, the new intraoperative highfield MRI," says Dr. Kiening. The success of the procedure was confirmed when the electrode was accidentally switched off: the patient had a bicycle accident which required surgery for which an ECG had to be made as preparation. The brain pacemaker was switched off and was not reactivated for a few days, and the depression promptly returned. A few weeks after reactivation, the patient completely recovered again. The neurosurgeons in Heidelberg and the psychiatrists in Mannheim now want to build on this positive experience and are planning a clinical study in which the habenula stimulation is to be implemented for severely depressive patients at five psychiatric-neurosurgery centers in Germany. "We aim to show that habenula stimulation has a better success rate than other target areas attempted for depression and that it is also safe to use," says Dr. Sartorius, Coordinating Investigator of the proposed study.